Yippeeeee! The new season starts. Can't wait to go back and forth hundreds of times per evening. Well, the new year is upon us and the practices are going strong. Good turn-outs and hard work by all. We still have room for a couple of new members. Tell your friends! Just a reminder I have still your hand paddles for those who have not picked them up yet. Will be at the UBC Meet on Sunday. Will have the hand paddles with me next Tuesday (Feb 14) on the pool deck, the price is $8.00 for the set. We need some recent comments on here! 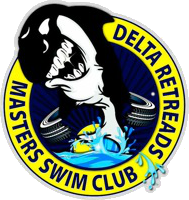 Good luck everyone for the upcoming Delta Tri and the Provincials this weekend - Retreads Rocks! Welcome back everyone! Hope you had a great summer.